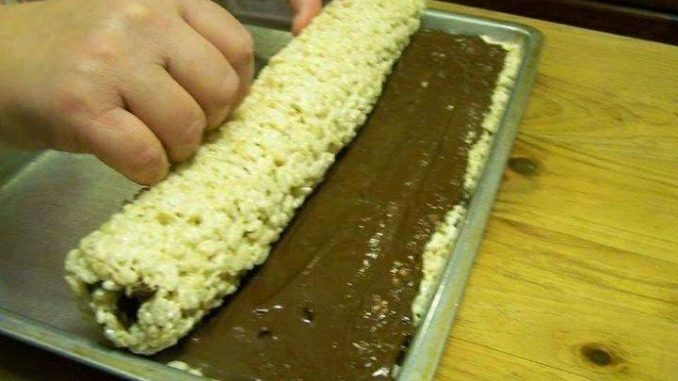 On the weekends, I love spending time in the kitchen coming up with new crazy recipes such as this rice Krispies roll ups! My family loved this roll so much! Check out the recipe. ¼ cup of melted butter. 10 ½ ounces of mini marshmallows. 5 ½ cups of rice krispies. 1 ½ cups of milk chocolate chips. In a 6 quart kettle, melt the butter and mix in the marshmallows and let melt over low heat then add in the rice and mix until well combined. Spread the the mixture in a greased 10 ½ x 15 ½ baking sheet. Melt the chocolate chips and peanut butter in the microwave for 1 minute intervals until completely melted stirring after each minute. Spread the chocolate and butter mixture over the rice krispies mixture and let cool. Loosen all around with a metal spatula and roll starting on the long side. Sprinkle the roll with seasonal sprinkles and slice to serve! Easy, peasy and crazy! The marshmallows and rice krispies go perfectly with the chocolate and peanut butter. I had some leftovers that I wrapped in saran wrap for the next day. Give it a shot, you will like it!